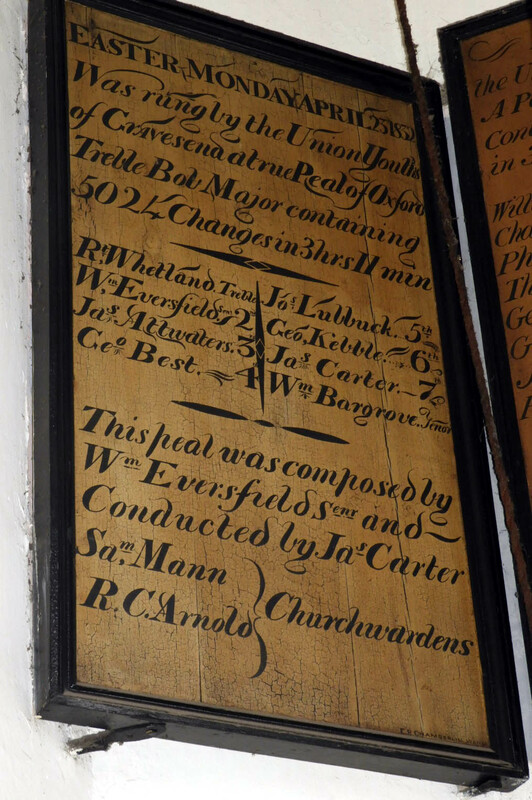 Frame: 1923 John Taylor & Co.
Treble (of 8) 4-3-20 28¼" E 1736 Richard Phelps Never Weight measured 1793. Recast in 1771. 2nd (of 8) D♯ 1736 Richard Phelps Never Recast in 1793. 3rd (of 8) 6-1-7 31¼" C♯ 1736 Richard Phelps Never Weight measured 1793. Recast in 1813. 4th (of 8) 7-1-12 33½" B 1736 Richard Phelps Never Weight measured 1793. Recast in 1871. 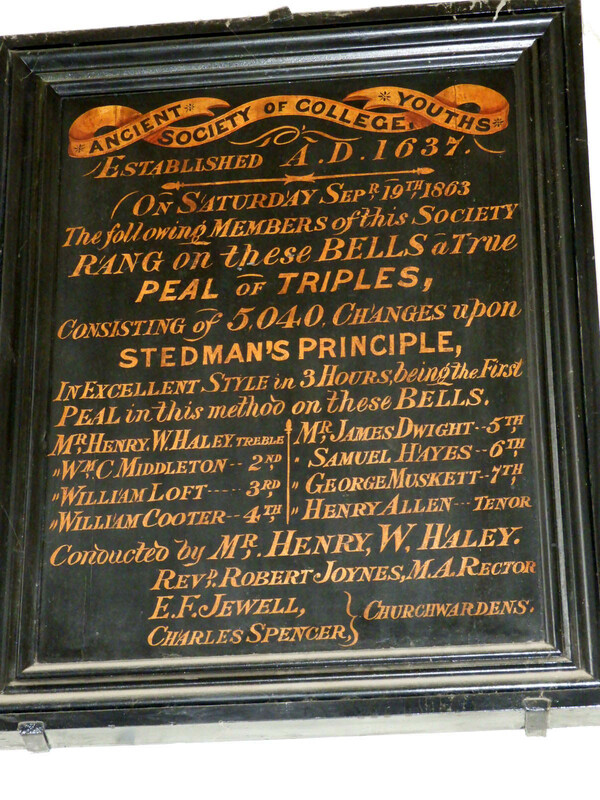 5th (of 8) 9-0-6 36¼" A 1736 Richard Phelps Never Weight measured 1793. Recast in 1902. 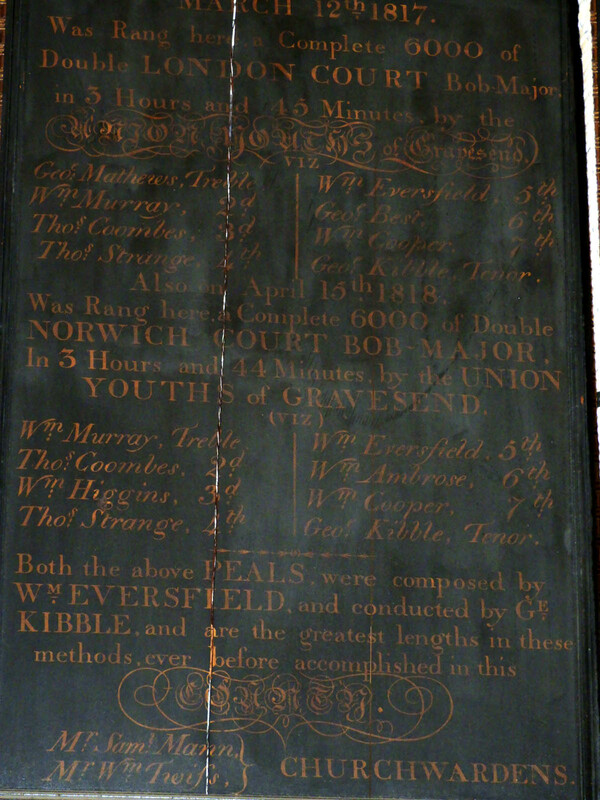 6th (of 8) 10-1- G♯ 1736 Richard Phelps Never Recast in 1771. 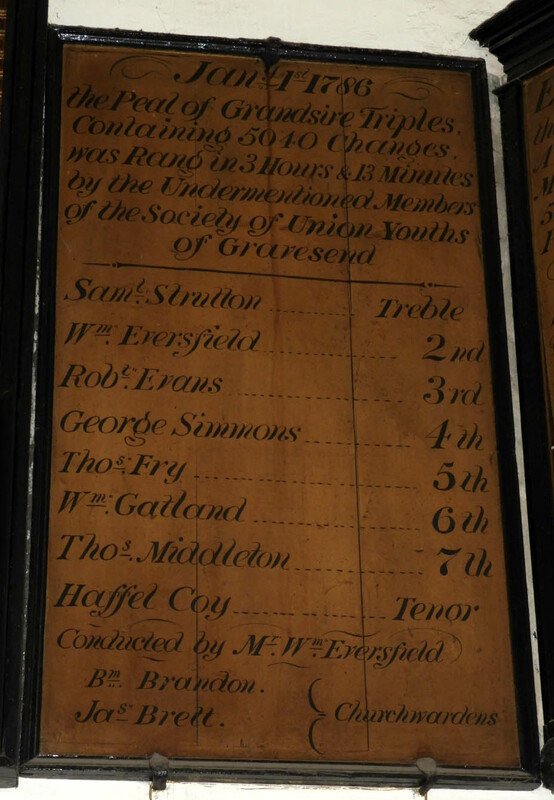 7th (of 8) 13-1-1 42¾" F♯ 1736 Richard Phelps Never Recast in 1923. 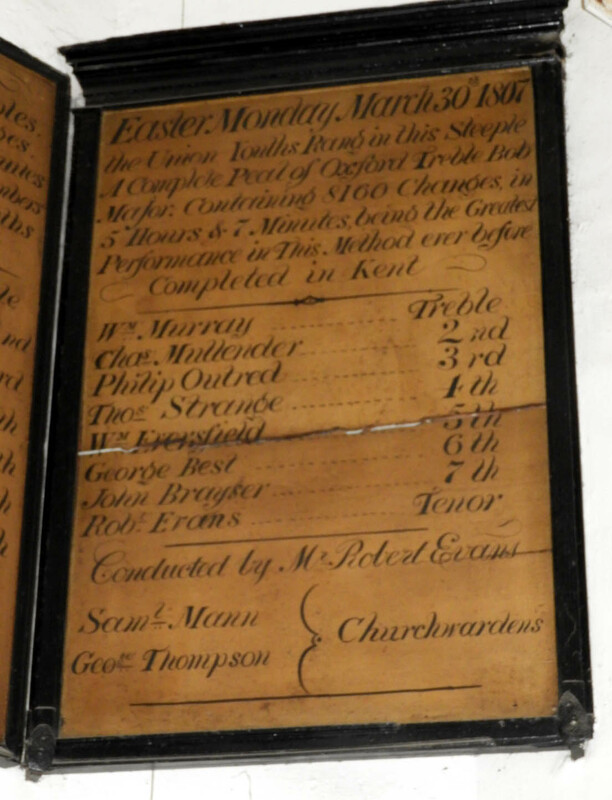 Tenor (of 8) E 1736 Richard Phelps Never Recast in 1793. 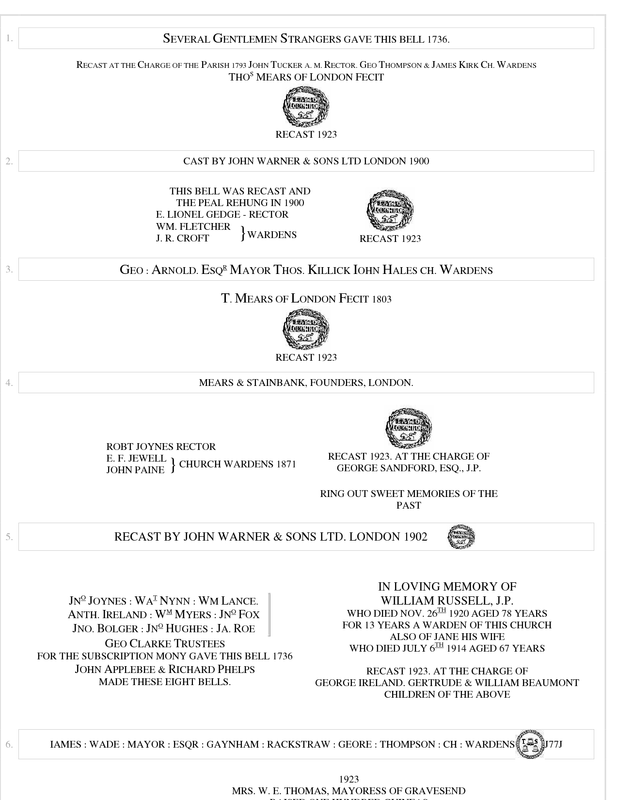 Treble (of 8) 5-1-9 E 1900 John Warner & Sons Never Recast in 1923. 2nd (of 8) 5-1-12 29" D♯ 1793 Thomas Mears I Never Supplied at 5-2-11. Recast in 1923. 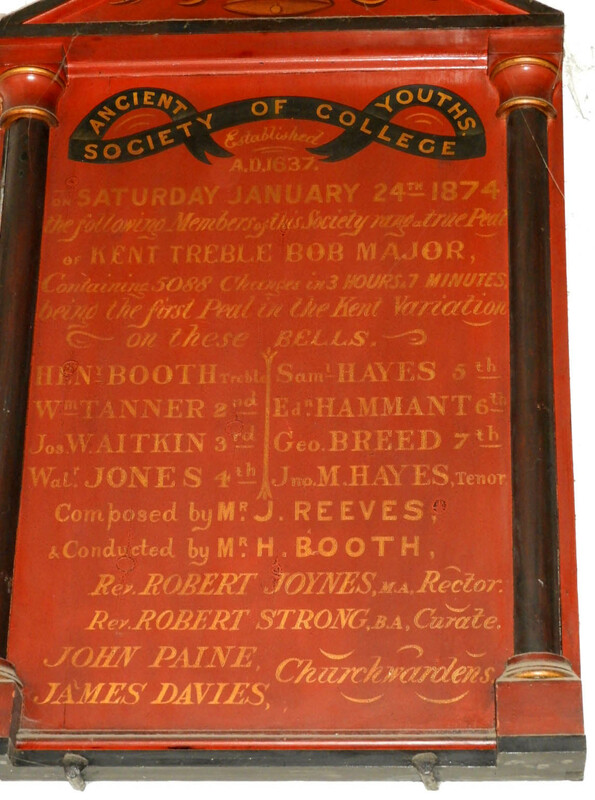 3rd (of 8) 7-0-6 C♯ 1813 Thomas Mears I Never Recast in 1923. 4th (of 8) 7-0-27 B 1871 Mears & Stainbank Never Recast in 1923. 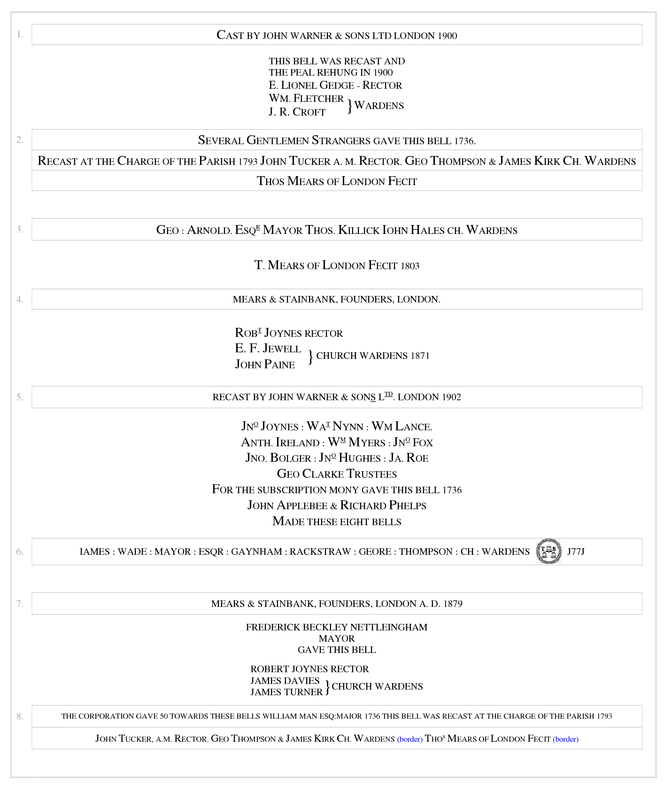 5th (of 8) 8-1-27 A 1902 John Warner & Sons Never Recast in 1923. 6th (of 8) 10-0-5 38¼" G♯ 1771 Thomas Swain Never Former weight measured 1793. Recast in 1923. 7th (of 8) 12-3-25 F♯ 1879 Mears & Stainbank Never Recast in 1923. 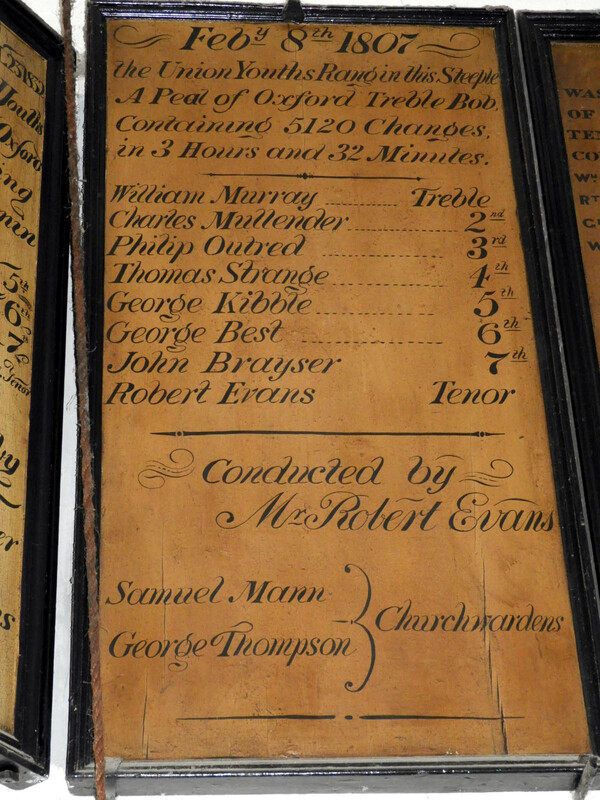 Tenor of 8 17-3-22 47" E 1793 Thomas Mears I Never Former weight measured 1793. Recast in 1923. 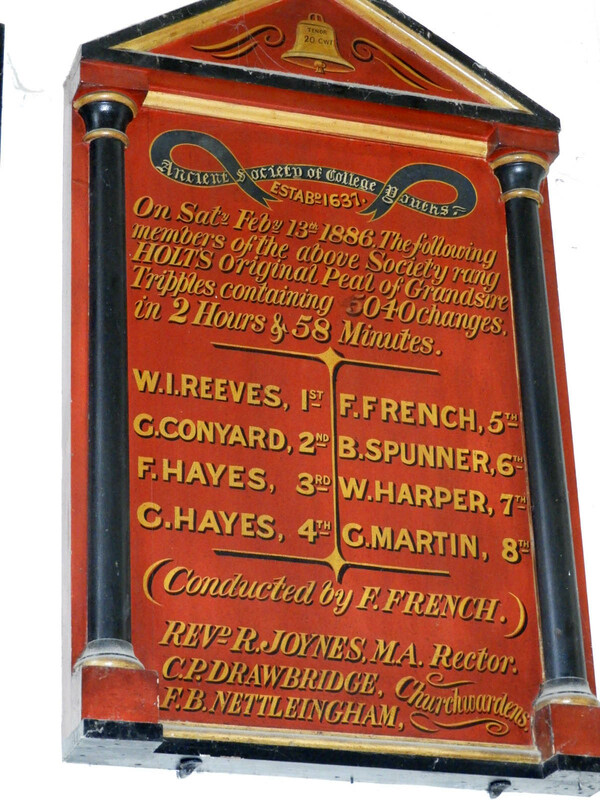 1522 The ringers were fined for not ringing at Bishop Fisher's visitation. 1731 Tower built between 1731 and 1733. 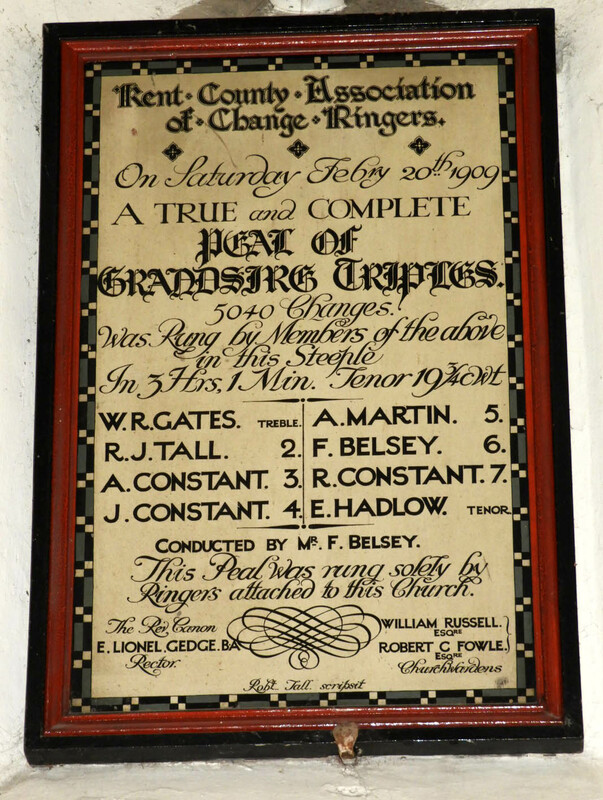 1736 Ring of 8 cast by Richard Phelps. 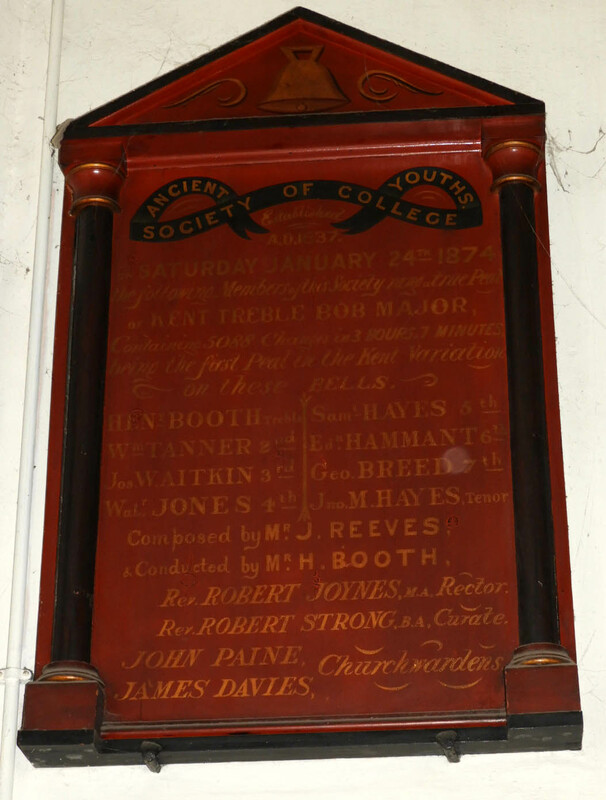 1771 Treble and 6th recast by Thomas Swain. 1793 2nd and tenor recast by Thomas Mears. 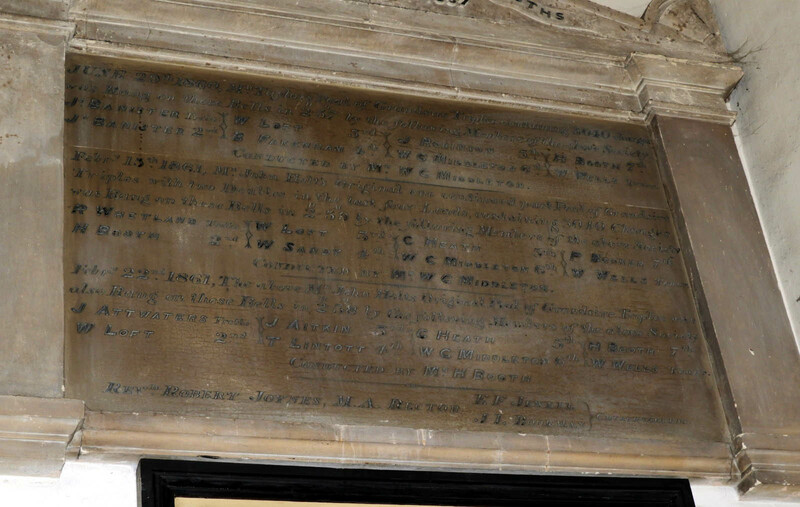 1813 3rd recast by Thomas Mears. 1871 4th recast by Mears & Stainbank. 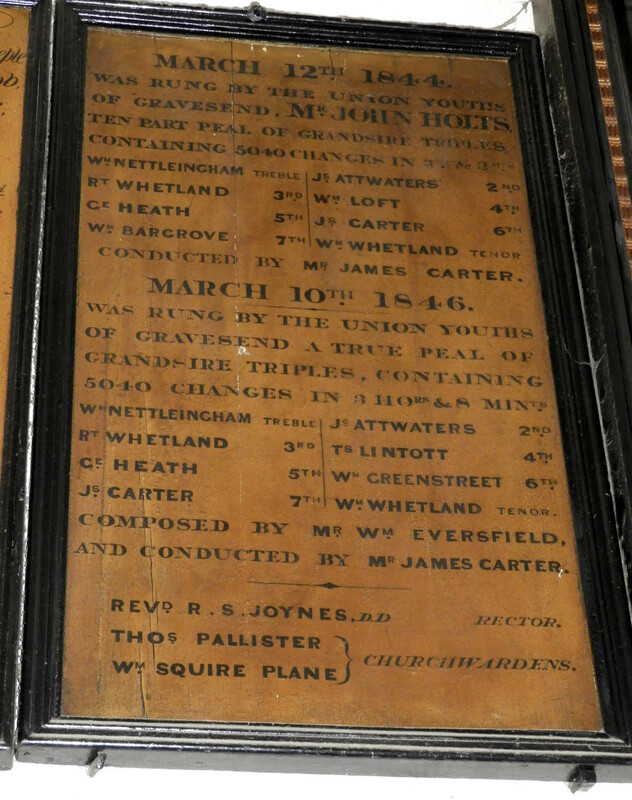 1879 7th recast by Mears & Stainbank. 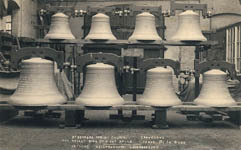 1896 Bells repaired by Samuel Goslin. 1900 Treble recast and bells rehung by John Warner & Sons. 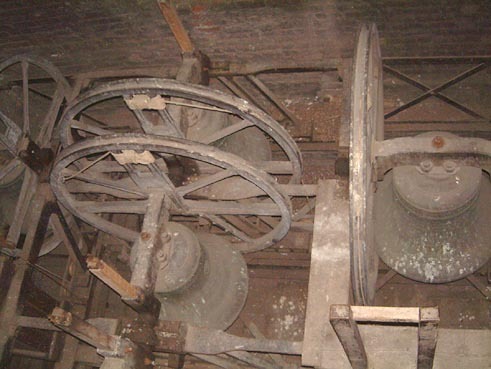 1922 December The old bells and frame were removed by William T. Billinghurst (Taylor's senior bellhanger at the time. 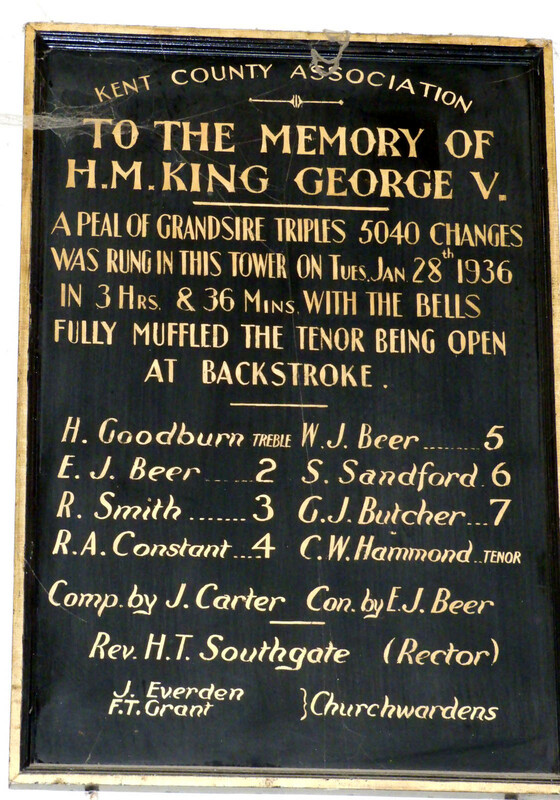 1923 A new ring of 8 bells as cast by John Taylor (on 1st Feb). 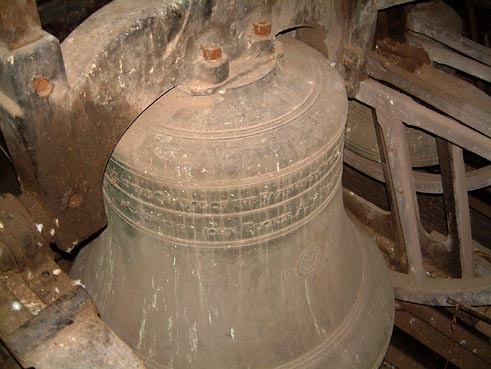 The inscriptions on the former bells were preserved on the new bells, although those on the treble and second became transposed in error. In May, the new bells and frame were installed by Richard Lane and George Smith. The total cost of the project was £789 10s. 0d. This was quite expensive at the time, but the result was an excellent set of castings and one of the best rings in Kent. 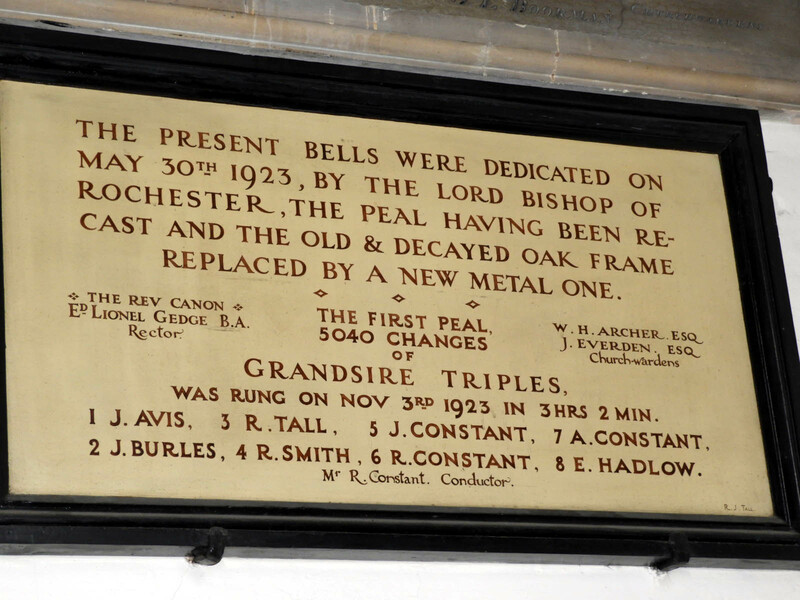 The new bells were dedicated by the Bishop of Rochester on 13th May. 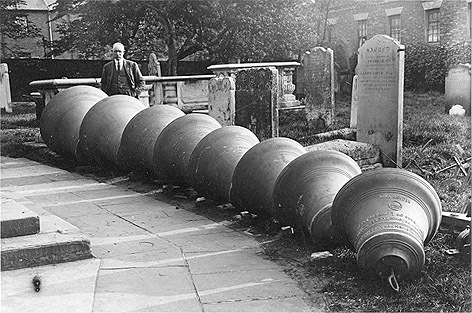 The new ring of 8 in the church yard prior to their hanging in 1923. 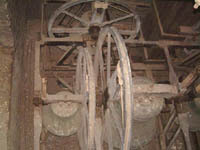 The belfry (north wall at top). 4th in middle, 5th above and 6th on right. 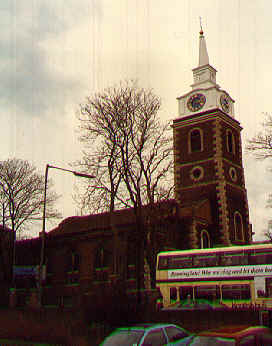 The belfry (east wall at top). Treble on left, 2nd above and tenor on right. 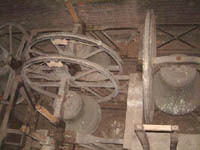 The 8 bells pictured at the bell foundry. 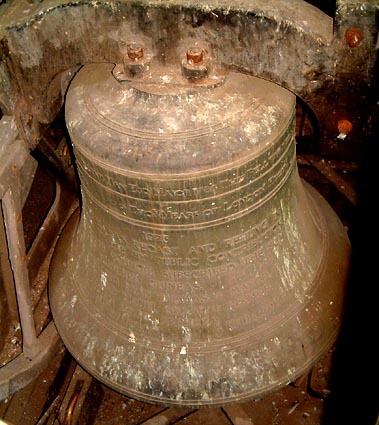 The front of the tenor with all its inscription.